In this capacity she has strengthened the UN interagency coordination and the cooperation with the Government of Serbia and Civil Society partners. She has lead the UN country team’s response to the floods in 2014 together with UNDP and to the refugee/migrant crisis in 2015 together with UNHCR. 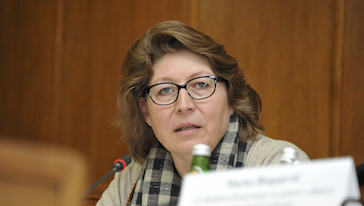 Prior to this appointment she has worked in different capacities for 28 years for the International Organization for Migration (IOM) in Asia, Europe and globally developing expertise in in Migration and Development, Labor Migration, Refugee Resettlement, Border Management, Smuggling, Integration, Trafficking and emergency response. Her last appointment was as Director of the Department for Migration Management (2010-2013) in IOM Headquarters in Geneva. Over the years she has served on boards of research institutions and developed strong collaboration with think tanks.